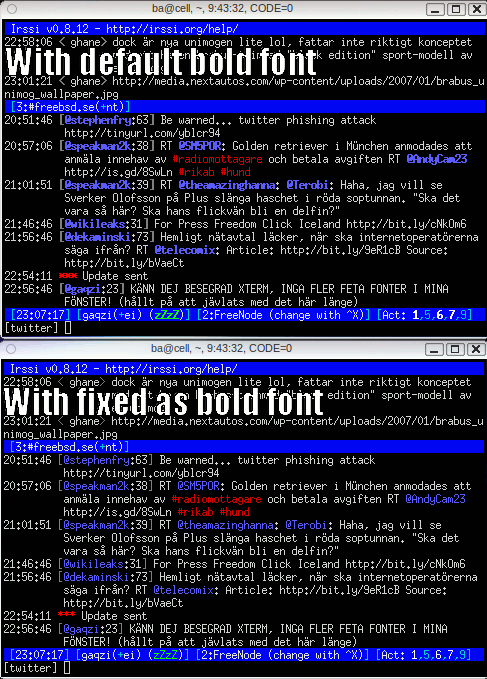 I’ve so far in all my travels never found a terminal I like better than xterm, maybe urxvt, but I’ve had a problem disabling bold fonts for a very long time. Update: Seems this is a known bug for xterm. There are a lot of X resource configuration options that makes you think you can disable bold fonts, but alas, I’ve had no luck with any of them. But if you set the same font for both normal and bold fonts it’ll work! This little gem of knowledge I found as an off-hand remark on a configuration page by Emil Mikulic, thank you! Into my ~/.Xresources and afterwards ran xrdb -load ~/.Xresources and started up a new xterm loaded with awesomeness!